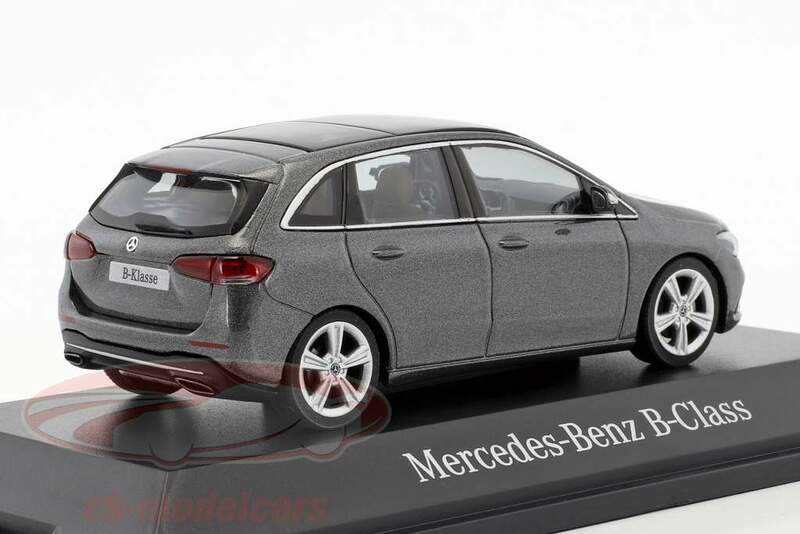 For quite some time, the traditional label Herpa is involved in the section of the production of modelcars in scale according to current role models. 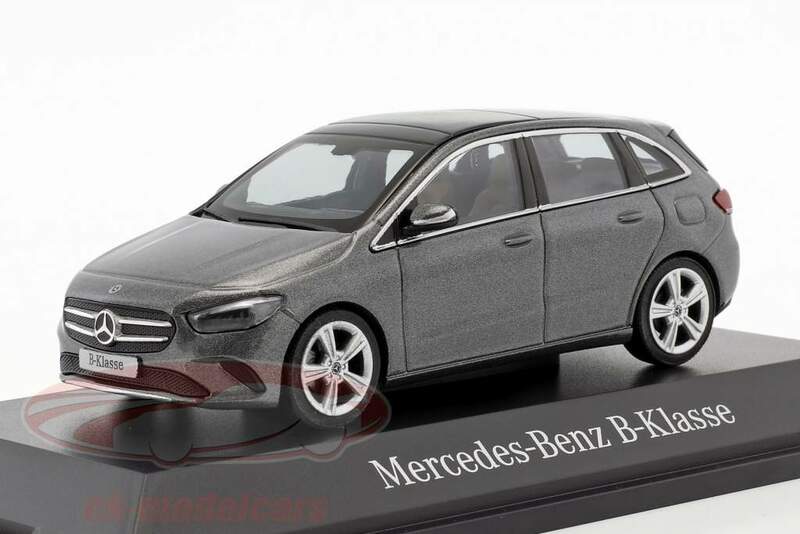 It was not like that for a long time: The licenses for the development of new appearing miniatures in the case of Mercedes-Benz was handed over mostly to Minichamps, Schuco and gladly to Norev. 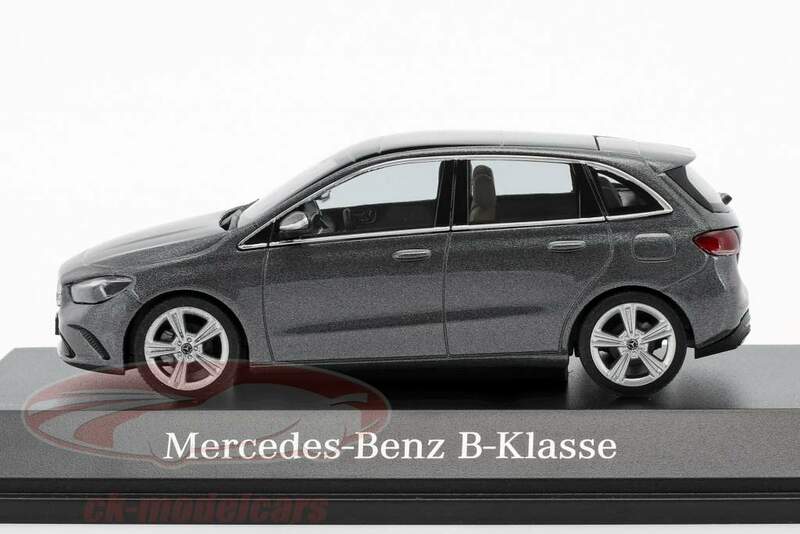 With the new B-Class of the model series W 247, the people from Stuttgart trusted in Herpa this time, what fairly surprises us, because Norev had proven itself as an excellent partner of Mercedes-Benz. Also the previous version W 246 came from Vaulx-en-Vaulin. This time, Herpa had to master the challenge of building the B-Class in scale 1:43 and did it very well. The models are first available in two colors: One of it is mountain grey (B66960456). With the new B-Class, Mercedes-Benz wants to emphasize the sport in the Sportstourer: It looks more dynamic than its previous version, drives itself according to the manufacturer agile and offers more comfort and space. The Stuttgart have presented the third generation of the five-door in October at the Paris Motor Show; next weekend she will celebrate her public debut with the dealers. The version adapted for transverse installation of the two-liter diesel engine series OM 654 with 110 kW / 150 hp and 140 kW / 190 hp already meets the Euro 6d standard prescribed for new types from 2020 onwards. At the market launch, the B-Class is to have a 1.3-liter gasoline engine of the type M 282 with 100 kW / 136 hp or 120 kW / 163 hp and also with a 1.5-liter diesel engine with 85 kW / 116 PS (OM 608). Also the dual-clutch transmission celebrates premiere. Externally the car is well desiged and adresses the target audience who perceive the new A-Class as too dynamic. Herpa met the line management exaclty. The appearance of the lines of the exterior was transferred very well to the model. This also applies to the basic features of the avant-garde interior of the B-Class, which, like the A-Class, can be ordered with the MBUX multimedia system. Because of the modern driver assistance systems, the latest edition of the Mercedes-Benz B-Class offers one of the highest levels of Active Safety in the segment: For the first time, it is equipped with safety systems from the S-Class and can thus drive semi-automatically, capturing the traffic environment up to 500 meters in advance and matches it with navigation data.